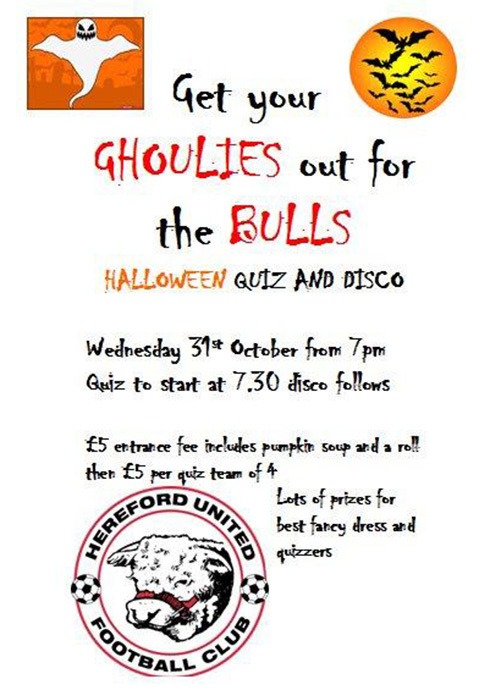 The proceeds of around £450 taken at this evening's Hereford United Halloween Quiz will be used towards the cost of the team coach to Wrexham on Saturday week. The quiz took place at the Starlite Rooms and was arranged by supporters to help the club at this difficult time. Chairman David Keyte and many of the playing squad attended. Meanwhile the final FA Cup Fourth Qualifying Round Game took place this evening so the prize money from Hereford's win against FC United should be on its way to Edgar Street in a few days time. In the tie Harrogate defeated Hyde 1-0. Below is a statement from Herefordshire Council following today's special cabinet meeting which was called to approve changes to the deal concerning the former livestock market which is adjacent to Hereford United's football ground. The Leader of Herefordshire Council, Councillor John Jarvis called a special meeting of Cabinet today (31 October) at which final changes to the contract to develop the Old Market site in Hereford have been agreed. Cabinet discussed changes to the initial agreement between the developers of the site (Stanhope plc) and British Land plc. With preparatory works and demolition underway, the meeting successfully resolved the few remaining conditions, paving the way for construction to begin on the new retail development imminently. The changes include that the council will waive £500,000 of money it would have received from the deal and that British Land will agree to relax some of its original conditions before the funding is released. Stanhope has also agreed to reduced returns from the deal and will bear additional costs that were not known at the outset. The discussion today has come about in response to changes in the market value of the development. By agreeing to the variations, the cabinet has ensured the Council will receive £1.5million from the developers as a capital receipt, before returning its £500,000 waiver. Nothing in the proposal has changed the agreement on lettings, which is in place to protect the economy of the existing city centre and with today’s news, critically, all three parties are now locked into the development; a major milestone for the project. Councillor Jarvis said: “We all negotiated very hard and I believe we have managed to deliver a really good deal for the City and the County. Everyone has made concessions but today’s agreement now means the only retail scheme to open in the UK in 2014 will be here in Hereford. The mayor of Hereford, Councillor Brian Wilcox, along with former Herefordshire Council leader, Roger Phillips, visited Hereford United last Monday and had talks with chairman David Keyte. Afterwards Wilcox spoke to the Hereford Journal. "Hereford United is an integral part of Hereford City and to risk going down this path (administration) to possible oblivion is unthinkable. "I ask all fans to support the club and if there are any benefactors who are willing to help and contribute a major financial injection it would be marvellous. "Please join Jesse Norman MP, me and many others at the Cup match. "A sell-out would be a wonderful help in the short-term as well as spurring the team on to win." The London Bulls are to have a social evening and fundraiser on the night that the Bulls are on TV at Barrow on Friday, December 7th. Former Hereford United chairman Graham Turner has hit back at comments about how he left the finances at Edgar Street when he moved to Shrewsbury just over two years ago. In particular he has spoken about the claim that under his watch an amount of VAT was claimed twice. "It’s a pile of invoices that appear to have been claimed in one quarter and then mistakenly claimed the next quarter. It was in the year 2008-09," said Turner as reported by the Shropshire Star. "I take great exception to the implication that we have been responsible for the £45,000 VAT debt there. "I put a lot of time and effort into that football club. "I think it is difficult to accept that I am being vilified for debts that we left and that is why the club is in trouble, which is far from the truth. "I can walk through the door for this FA Cup tie with my head held high and say we left this club in a very good condition. "My conscience is clear without a shadow of a doubt. I stayed for 15 years at Hereford and I am pleased with the contribution I have made to that football club. "It upsets me a bit to see the club in the state it is in at the moment and I just hope somehow it can survive." Turner has also spoken to BBC Radio Shropshire. "I've asked for the full report from the VAT man so that I can go to our auditors at that time and may be challenge them. "The £45K VAT debt is just a drop in the ocean compared that are at the club at the moment." Turner also mentioned the £1M debt at Edgar Street which has since been paid off. "We had to work with that debt. It would never be paid off in terms of the cash. "But we negotiated a new lease with the council for the football facilities and round the outside they were willing to give some more land into the project. "And then we progressed it to building a new stand at the other end of the ground. "I got reputable football stadium architects in, we designed the stand as a just under 2,000 all-seater, all the facilities you would want. "And the funding and grants was all there for it to be built. "So everything was geared up to go. "The council would have then allowed developers to have develop the outside, maybe a hotel, student accomodation. "They would have got what they wanted, the club would have shared a part of the profit from those developments and the council would have benefited. "It was a win, win situation." Ticket sales continue through to 4pm on Friday for Saturday's all-ticket FA Cup match. The office is open today until 4pm for sales, with late night opening tomorrow (Thursday) til 7pm. Friday the office is open from 9am to 4pm. Both the individual FA Cup ticket and the double deal with Tuesday's match with Luton are still available. Former Bull Dean Smith has signed a new 2 year deal at Walsall after their impressive start to the season. Usually relegation battlers, the Saddlers have forged a comfortable mid-table spot this term. Newport have released defender Mark Cooper. The former Bristol Rovers youngster signed for the Exiles in the summer after a trial but failed to make a first team appearance. Lincoln have handed full back Peter Gilbert a permanent contract til January. The former Southend man signed non-contract terms when he arrived at Sincil Bank at the start of the month. Nuneaton have signed Coventry defender Kevin Malaga on loan for an initial month. The Frenchman has not played for the Sky Blues since Mark Robins arrived as manager. Former Bulls coach Lennie Lawrence is reported to be set to quit Crystal Palace to follow Dougie Freedman to Bolton after the Eagles demanded a six-figure sum for his services. We asked the Chairman what the club were currently doing to assist with the financial plight. A share issue is being explored further as was mentioned at the shareholders meeting. There is a feeling of there being a lot of 'dead' shares so the possibility of raising capital through a share issue is ongoing. Gary Peters' contract was terminated by mutual consent as a further cost cutting exercise and the club are looking daily at ways to save money. They are very aware that it is or paramount importance to be looking at 'cutting the cloth' accordingly and actively cutting costs for any potential future investment. The Board are still pursuing the link with Herefordshire Council over the bond that was allegedly lodged for £100,000 which was to be released upon the renovation of the Supporters Club. Minutes are trying to be located and acted upon. The Club have enlisted the help of Hereford MP Jesse Norman who has written to the CEO of HMRC, with a view to them extending the timescale for the payment owing to them. He has received a holding letter from them whilst matters are looked into. After initially offering a payment to HMRC, a decision was taken not to pay them as their view was that if we did not make the full payment then they would still look to commence legal proceedings. In the light of us needing to win a vital Cup match to secure much needed capital, it was decided to pay the playing staff which will hopefully secure a good result on Saturday. At the request of HUISA, the club have agreed to reform the successful Liaison Committee which involves the Club and the associations meeting and galvanising in a combined effort to weather the storm and take the club forward. In the light of this HUISA have arranged a Fans Forum to be held in the Starlite Room, hopefully on Wednesday, November 14th, 7pm start, where supporters can gather to share any fund-raising ideas that will benefit the cause. It is stressed that this forum will be looking forward to the future and not backwards. We feel that all factions working together are our best hope of seeing this difficult time through to a successful conclusion. HUISA's movement into the 21st Century is being worked on at present with hopefully the setting up of a website with a little help from our friends! Let's not forget, Hereford United Football Club belongs to all of us, not any one individual or association. Keith Dodd, chairman of HUISA, has given BBC Hereford and Worcester an update about the financial situation at Edgar Street. HUISA met with the board last night. "We all sat down with the board and decided that we needed to pull all these resources together," said Dodd. "There's a tremendous amount of fund-raising going on at the moment. "Cheques were handed over at the meeting and people were bringing in money most of the evening. "The fund-raising is going all but what we want to do is combine all of it. "We agreed we will not ring-fence this money because we need to get the club that money immediately so it can solve these problems." Dodd was unhappy with H&W's questioning of chairman David Keyte yesterday morning. "Hereford United needs all the support it can get at the moment and I don't think that trying to cause controversy between Graham Turner and David Keyte is currently helping the situation. "Keyte has come in, not had the best of luck in any circumstances under the sun. "He's admitted to making mistakes. "We're all trying to help this great club survive where we need every penny we can. "That's what we should be concentrating on at the moment, not trying to stir it up between two people who have helped the club." HUISA will be releasing a statement later today. Herefordshire Council are expected to pay Stanhope an extra £500,000 to ensure the former livestock market, next to Edgar Street, redevelopment goes ahead. It appears that there will only be five big lets on the site instead of the six that was hoped for. Consequently the income will be reduced. So Stanhope feel they need some extra money to guarantee the scheme and the Council will agree to fill some of the hole at a cabinet meeting tomorrow (Wednesday). "The market conditions are extremely challenging at the moment and this is going to be the only scheme that comes forward in 2014," the leader of Herefordshire Council, John Jarvis, told BBC H&W. "We accept we are going to have to waive £500,000 income from the scheme. "British Land have agreed to change their requirements from six lets to five lets - Waitrose, Debenhams, Odean, Next and TKMax. "Because of the fact that the market conditions have changed and the yield from the capital they spend is having to be slightly modified, then they are going to have to find £3M less on the deal and also spend another £1M more than they anticipated. "The alternative is that we have the biggest car park in Herefordshire. "The big money behind this deal is British Land who are putting £90M in here and it's decided that they should have a percentage return from that money. "We will agree that the yield can go up by 0.2% - that is £3M and our share is £0.5M. "Either we go with that or the scheme will collapse." Hereford United were knocked out of the FA Youth Cup by MK Dons at Edgar Street this evening. The FA have announced the officials for next Saturday's FA Cup-tie between Hereford United and Shrewsbury Town. Sutton refereed twice at Edgar Street last season, however the Bulls lost both of those games. The first, last Setember, was a 2-0 win for Aldershot in front of a gate of just 1599. Joe Heath was booked. Sutton's second game was last February when Swindon were 2-1 winners. Rob Purdie scored Hereford's goal but he was booked along with Simon Clist, Kenny Lunt and Will Evans. To date this season Sutton has been in charge of 10 games in which he has given out 29 yellow cards and 1 red card. The timescale on how soon the taxman acts on the Bulls may be a little slower after they inadvertently submitted a winding up petition on Conf South side Dorchester Town. The club were stunned by the news on Monday morning, but HMRC admitted a mistake and withdrew the demand with the club fully up to date on payments. Former Bull Byron Anthony is reported to be on Newport's radar as they search for a new defender to bolster their ranks. Luton have been rebuffed in a bid for Nuneaton striker Adam Walker by the player himself. The seven goal forward turned down the move, which would have seen two Luton players join the threadbare Boro squad, as he is in his third year at Coventry University and didn't want to disrupt his studies. Shrewsbury have announced that their trio of loan players have been given approval to play in Saturday's FA Cup match. Former Bulls loanee Lee Collins has extended his loan into another month and been given permission by Barnsley to play on Saturday, while Premier League youngsters Jeremy Helan and Jamie Proctor have also been given the go-ahead to play. Meanwhile, The FA could delay payment of the Bulls' prize money from the Fourth Qualifying Round further if the last outstanding tie of the round is postponed again. Hyde's trip to Harrogate is due to take place tonight but is subject to a 1pm pitch inspection. If the tie fails to go ahead, with Harrogate's ground failing inspections for games on both Saturday and last Tuesday, they will attempt to play the match tomorrow. Update: Match postponed. Game has been rescheduled for tomorrow night at nearby Harrogate Railway's ground. Hereford United chairman David Keyte has spoken to BBC Hereford and Worcester about the difference in approach being taken by him as opposed to when Graham Turner was chairman at Edgar Street. Keyte was asked how the £45K VAT debt had come about. "The VAT element is basic book-keeping," said Keyte. "It will be a missed invoice, or an invoice claimed twice or something like that and the VAT officers have the job of going out to check these things. "It's a pile of invoices that appear to have been claimed in one quarter and then, mistakenly, claimed the next quarter." Asked were all the books straight when he took over, DK replied that was an impossible question. "You do your due diligence, but nobody goes into every single invoice in every single year. "It was in the year 2008/09 under Graham Turner's management. "Myself and Tim Russon went in June 2010." Turner claims he left the club with a healthy balance. "In financial terms Graham left a good amount of money in the bank account, £450,000, but there was, and has been for a number of years, a debt of over £1M over the club. "What we are saying is that there were two different approaches to the financial side of the club - whether you operate on a week to week cash basis and ignore the long term debt or whether, as is my approach, to try and get hold of the company and I think that's a significent difference. "Hereford United 1939 Ltd is a company which had a debt of over a £1M which did not have the leases to the ground due to that debt. "My approach when entering into it was not to just carry on from three o'clock to three o'clock every Saturday with football only it was to try and pick up the company and take it forward for the longer term good of Hereford United." H&W : "You inherited that £1M debt despite having £450K in the bank?" "Clear as day. Every shareholder knows that," continued Keyte. "The company books were negative because of the long-term debt. Nobody had made any inroads into it. "That was a strategic decision of the previous management. That was their choice. They effectively left the debt on one side." H&W : "You're picking up a £0.5M debt - Graham Turner would say he left the club in a very healthy state. I would question if that's right"
DK : "It's not for me to question Graham's approach to finance but shareholders of the company are fully aware that yes there was a steady build up of cash over ten years which is excellent in it's own right. H&W : "Would you have done that?" DK : "Clearly not, my approach was to get hold of the company and steer it's own destiny. You can't do that if somebodyelse owns the leases to the football ground you play on. "We've used the cash to buy back the leases for the longer term progress of the club. At this time, two and a bit years later, we've not had a clear oppurtunity to develope the football ground. "I can assure you that the £450,000 that went in to buy the leases would be a small figure compared with what you would get in return." The interview then turned to Saturday's FA Cup game against Shrewsbury. "I think (ticket sales) have gone through the 3,000 mark including season tickets. "A great occasion for us, perfect in the circumstances. "Great to get Graham back here with all the ingredients of him bringing Shrewsbury Town to os again. "They're not doing quite so well this time in League One, albeit two Leagues above us. "I think it will be the crowd, or can be the crowd, that get us through this one if everybody continues this getting behind the club mentality that's clearly around in this last week or ten days. "We've had £20K of donations from various people which is superb and it's that togetherness that could well get us through on Saturday." The Bulls u18 side face MK Dons in FA Youth Cup action on Tuesday night, kick off 7.30pm. Entrance for the match is through Addisons Bar. A significant policing operation is in place ahead of Hereford United's local derby match with Shrewsbury Town on Saturday 3 November in the FA Cup. The fixture - which kicks off at 1pm - will attract one of the biggest crowds of the season at the Edgar Street stadium and police are anxious football supporters can enjoy the occasion without incident. They have issued a warning that anyone causing trouble is likely to be arrested, charged and put before the courts. The local police commander has also advised all supporters to arrive in good time and reminded away fans they must have a ticket bought before Saturday. There will no tickets available to buy on the day for them. T/Chief Inspector Martin Taylor said: "There will be a substantial policing operation to ensure genuine supporters from both sides can enjoy the game in safety without interference. "The last fixture between these teams at Edgar Street saw very few incidents of any note and the aim of our operation is to ensure that Saturday's game is equally trouble free. However, officers will deal robustly with any individuals who commit public order offences. "We are working closely with British Transport Police and also our West Mercia Police colleagues in Shrewsbury. A number of police officers from Shrewsbury who are aware of known troublemakers will be attending the match to act as spotters. Anyone who has caused previous problems will be well known to them. "I would like to remind supporters that the game is all ticket and that there will be no admittance to the ground without a valid match ticket." According to Shrewsbury Town, they have sold 500 tickets for next Saturday's FA Cup game at Edgar Street. They went on sale this morning. Originally Hereford sent 702 tickets to Shrewsbury but another 800 will be made available. These will be for the Blackfriars End. Hereford asked Shrewsbury to ensure the Cargill Stand tickets were sold first and it appears all the terrace tickets have been sold leaving around 200 seated tickets available in that stand. The meeting to discuss a Supporters Trust has been postponed. Organiser Your Hereford has said that they are in talks with Supporters Direct, who have advised that a strategy should be put in place before an open meeting. A meeting is still planned to take place at a later date. Tickets for the FA Cup match with Shrewsbury continue to be on sale up to Friday afternoon. Fans are reminded that the match is all-ticket, and no tickets will be available on the day. Sales continue from the Club Office from 9.30am to 4pm everyday through to Friday. The double ticket offer is also still available, with a ticket for the Shrews match combined with a ticket for next Tuesday's home match with Luton saving up to £7 on normal matchday prices. Tamworth signed Cambridge winger Adriano Moke on loan before the weekend's games. The former Nottm Forest trainee only joined the U's in the summer from York, but has struggled to play regular games. Accrington have offered caretaker boss Leam Richardson the job on a permanent basis. The 32 year old has spent the last seven years as a player and coach at the Crown Ground and is also wanted by former boss Paul Cook to be his no.2 at Chesterfield. Newport boss Justin Edinburgh says he will sign two new players in a bid to arrest his side's recent poor form. The Exiles have conceded nine goals in three games, and are expected to farm two players out on loan to balance the books. Dartford are reported to have lost the services of loan forward Adam Birchall after Gillingham opted not to extend the loan. The former Dover man scored once in six games. Former Bulls winger Lionel Ainsworth is set to miss two months after slipping and dislocating a shoulder in Rotherham's pre-match warm-up on Saturday. Wrexham striker Brett Ormerod will be out for 'a few weeks' after damaging a hamstring in training. The veteran forward will be assessed this week to determine the extent of the injury. Director of football Gary Peters has left Edgar Street. Below is a statement from Hereford United chairman David Keyte as published on the OS this morning. position and we have mutually agreed that the position is no longer required within the club. "Gary joined us at a difficult time last year and got an immediate response from the players. In recent months he has also helped with the selection of and settling in of Martin Foyle and Andy Porter. a lack of experience within the football club was evident on his arrival and we have benefited from Gary’s experience and guidance. He leaves the club in a better state than when he arrived. As expected a meeting to look at the possibility of setting up a supporters trust at Hereford United has been arranged. UPDATE 12.30pm: The meeting has been postponed to allow Supporters Direct time get a proper strategy together before any meeting. Next Sunday, I have planned a meeting for all Hereford United supporters to discuss the future. The meeting will include a discussion on the possibility of a Supporters Trust. Several fans have already committed themselves to attending and we also have a couple of HUISA members, including a co-founder of HUISA (Gary Bradley) attending. I have been posting under the username of 'YourHereford' on Bulls Banter over recent days. YourHereford is a group that has been set up to help inspire the people of Hereford to seek positive change in the community they live in. We have been working hard lately on a number of local issues, one being the racecourse and are hoping for some more news in the week ahead. Hereford United is a huge part of the city of Hereford. The club brings in a lot of business to the city throughout the season and the financial issues the club faces are not just a worry for Hereford supporters, they should be a worry for the city as a whole. Whilst many have quite rightly helped the club financially over recent weeks, I have myself become a bit worried regarding the debt that is owed to the taxman. I believe that supporters money should be ring fenced and once a target amount is reached, it should be used to pay the priority debt to the taxman. Whilst I'm happy to see the hard working staff and players at the club paid, I think it would make more sense to of kept the money. During the meeting I would like the supporters who attend to discuss many issues, including how a Supporters Trust could go about making positive changes to put Hereford United back on a forward route. Today the Exeter City Supporters Trust offered their help and they will hopefully be sending over some more detailed information about how they were set up and how they are so successful with over 2800 members each paying £2 or more a month to 'own' the football club. The Supporters Meeting is likely to be on Sunday 4th November at about 2pm (Hopefully somewhere at the HUFC). To remain updated, simply keep an eye on Bulls News. Or alternatively, follow YourHereford on twitter. If anybody is also interested in speaking at the meeting then please get in contact. All contributions are welcome. This coming week promises to be an interesting one both on and off the pitch at Edgar Street. Whilst the main feature will be the FA Cup game against Shrewsbury Town on Saturday, there's also the on-going financial problems, the promise of a meeting to discuss the idea of a supporters trust and the possibility that former manager Graham Turner might comment on how Hereford United has faired since he moved up the A49. And we mustn't forget Movember. Today - Ticket sales continue for Saturday's game. Please note a double fixture ticket is available which covers next Tuesday's game against Luton. The club office will be open until 9pm both this evening and tomorrow (Tuesday) evening. Today - Expected announcement from 'YourHereford' about a meeting to discuss the possibility of setting up a supporters trust. Wednesday - Players should be paid for October. Wednesday - Halloween quiz & disco at the Starlite Rooms from 7pm. Wednesday or Thursday - Shrewsbury manager Graham Turner may say a few words about the current financial problems at Edgar Street. Thursday - The start of Movember which should see all the squad begin to grow a moustache in aid of the charity. Friday - Chairman David Keyte is expected to give an update to the media on the financial position and may also comment on anything Turner may have raised. Saturday - A very important FA Cup-tie against Shrewsbury which is all-ticket for both sets of supporters. A full house and a win for the Bulls would be most welcome. Finally - Donations, large or small, to help keep the club afloat are still required. They can be sent via the link on the top of this page or dropped into Edgar Street. With some fans suggesting that a Supporters Trust may be the way forward for Hereford United, BN looks back ten years to 2002 when the same idea was floated. However whilst there was plenty of interest at the outset, the idea soon faded possibly on the back of then chairman/manager Graham Turner bringing in several new players and Richard O'Kelly as coach. The launch, due towards the end of July, never happened. A meeting of Hereford United supporters (held on May 10th 2002) backed further investigation into the Supporters Direct scheme which could see the fans take over the running of the club. An almost unanimous majority voted for the initiative following a speech from Supporters Direct officer Simon Vince. Martin Watson, who is behind the Hereford United bid for a supporters consortium to take control of the club, answered questions as did Richard Burkin, Keith Dodd and Gary Smith. Kevin Wargen, the HUISA chairman, chaired the meeting. It was revealed that two anonymous backers have stated an interest in the club, but will only stay on board if Graham Turner remains. Also, it is unclear whether they will work with a supporters trust, or if they will reveal their identity. Martin Watson said that they will remain anonymous for at least twelve months. The supporters trust would see as many shares as possible collated together under one scheme, which would include buying Graham Turner's share and investigating the whereabouts of many others. Eventually, the supporters would be in control of the club, running it seemingly as a not-for-profit organisation. Enfield Town's supporters are in full control of their club, and around sixty clubs are now part of the scheme. There was some opposition and apathy to the scheme, but the overwhelming feeling was that a supporters trust is the future for Hereford United. Simon Binns from Supporters Direct was unable to attend tonight's meeting at the Richmond Club, but fifty or so turned up to discuss the next moves for the Trust. It was agreed unanamously by a HUISA postal ballot that a trust should be formed, and it was agreed that a working party would be set up to organise the launch and constitution of the association. Eleven people were named and the party would disband on the launch date, when a new committee and working party would be set up at a meeting. The launch should be within about six weeks. For the second Saturday in a row, the Bulls headed north and Harwood Bull was on hand to watch the action. October 27th, the sun is shining in a clear blue sky, it’s crisp and cold, and the genteel seaside town of Southport beckons. The good lady wife and I headed there, she went to scour Southport’s many charity shops (22 I’m reliably informed) for bargains, whereas I made tracks to Haig Avenue to see the Sandgrounders take on the Bulls. What’s in a name? The origins of Sandgrounders aren’t too hard to work out. I did Google it but just found a lot of boring debate about how many generations of your family had to live there before you were a true Sandgrounder, so I’ll spare you that. As for the Merseyrail Community Stadium, as Haig Avenue is now known, you can’t blame Southport for taking the name on, I’m sure they need the sponsorship as much as any club at this level. The use of the word ‘community’ in the title I’m fairly sceptical about, I’m sure it’s used just to give the sponsor some credibility as having some commitment to the local populace. Maybe I’ve just been watching ‘The Thick of It’ too much. As for the game, Ex Landlord has already provided a detailed report, so I won’t attempt to match that, just give a few thoughts. First of all is what a silly prat James McQuilkin was to get booked. After resisting the ref’s attempts to move the free kick back, he finally retreated to where the ref thought the correct spot was, and then promptly threw it forward again back to where he’d started. Not surprisingly the ref didn’t like him taking the piss and he got the yellow card. Not very clever. Given that we don’t carve out too many clear cut scoring chances in open play, I think we need to work on the set pieces a bit more. It amazes me how poor the delivery is from free kicks and corners. Even at this level a professional footballer ought to be able to put the ball close to where he wants it when kicking a dead ball with no one challenging him. How hard can it be? Come to think of it I can’t remember a Bulls player who could consistently deliver a good ball from dead since Terry Paine, and that’s a long time. Sam Clucas did a pretty good job on the left wing. Took his goal well and showed lots of determination and some skill in battling past defenders to get a cross in. The final ball wasn’t always right, but he always looked capable of making a chance for the strikers. One of the most dangerous crosses of the afternoon was produced from the right by Bowman but, probably because he was out on the wing, there was no one in the middle to knock it in as it flashed across the six yard line. Bowman does look pretty isolated up front, 4-5-1 is all very well, but midfield need to get up more quickly in support. And then when we change to 4-4-2 it needs someone a bit more athletic and mobile than Perry. I chipped in my £50 to the fighting find, but I won’t be doing it again. As long as the money goes directly to pay the debts I will be satisfied but I’d hate to think I’m just securing Gary Peters’ job. At some point reality has to take over. However, a lot of clubs have survived a lot longer with bigger debts than us. Let’s hope next week generates enough cash to keep HMRC at bay for a while. The Hereford United squad are to support Movember, a charity dedicated to mens health. In his post-match interview James Bitner said he would take part. The players at Edgar Street will shave off any current hair so they can start afresh from next Thursday which is November 1st. Yesterday manager Martin Foyle was asked about the idea. "I've given it to the players and they are all for it. It's such a great cause." Hereford United came away from the curiously named Merseyrail Community Stadium (Haig Avenue to football folk) with a point having taken an early two-goal lead through Sam Clucas and a Ryan Bowman penalty when the hosts hit back with a dubious goal and a slightly fortunate penalty equaliser. Martin Foyle named an unchanged 4-5-1 side with Josh O’Keefe and Luke Graham added to the bench. Clucas swung in a cross shortly after the start but it was cleared without threat and Southport forged a cross from the left that Bittner was quickly out to gather. Then on six minutes The Bulls took the lead. Marsh provided a through ball that Clucas ran onto before rounding the keeper and slotting into the empty net. The Sandgrounders responded with a move down the left from which a header went wide before McQuilkin had a chance to double the lead but his shot from the edge of the box was blocked although his darting run was interrupted on thirteen minutes and a penalty resulted. Bowman took the responsibility of the spot kick and duly fired home from twelve yards. Walley made a forceful 40-yard run down the left but his curling effort went wide with Bittner untroubled. For The Bulls, Marsh cut in from the right before laying off to McQuilkin but James’ shot rose over the bar. Heath was carded for a late challenge on the dangerous Walley and when the free kick came in to The Bulls’ box, there was some sketchy defending before the ball was hacked away for a corner that was to result in a strange goal for the hosts. While an inswinging ball was whipped in from the right, Lever (the left back) made a run straight at Bittner and took out the keeper without any attempt to go for the ball. The result was that the ball curved into the net with Bittner only able to protest to an unsym-pathetic referee. following some pedantic refereeing before Southport were awarded a slightly fortunate penalty (I believe their sixth in eight games) when Tames went down easily following contact with Chris Todd. Fullback Lever, the guilty party from the first goal, stepped up to fire past Bittner and level the score. After all this time, I still don’t understand how a slight touch on the shoulder can cause both feet to fly up in the air. The Bulls were out early for the second half and Bittner was again impeded but the ball was cleared by Stam. Bowman went on a driving run down the left but was cruelly blocked on the edge of the box and the resulting free kick from Clucas was gathered by keeper McMillan. The hour mark produced a tactical change from Foyle as The Bulls moved to 4-4-2 with Perry joining Bowman up top in place of Marsh and O’Keefe taking the place of James in midfield. Heath played a long ball forward that was hoofed out of the ground by the agricultural Parry and Walley produced another cross that Stephenson poked straight at Bittner. Clucas cut inside and blazed over the bar and Bowman grafted his way down the right before squaring across the box but no Bulls’ player was on hand to finish. Smikle replaced a tired Harry Pell before Clucas’ cross was glanced wide by Perry. Smith blasted against Bittner’s crossbar before, in a final insult, the referee awarded a free kick when home keeper McMillan was apparently impeded. A pity that he’d failed to spot the same infringement the resulted in Southport’s first goal. Hereford: Bittner, Gallinagh, Stam, Todd, Heath, Marsh (Perry 59), McQuilkin (O’Keefe 59), Evans, Pell (Smikle 77), Clucas, Bowman. Unused subs: Graham, Clist. Southport: McMillan, Lynch (Smith 68), Grand, Parry, Lever (Willis 89); Whalley, Poku, Moogan, Ledsham; Stephenson (Almond 68), Tames. Unused subs Hibbert, Benjamin. Attendance: 1,028 (including 143 from The Glorious Shire). The Bulls worked hard throughout the game and Southport were more than a little fortunate to earn a point and we now look forward to the mouth-watering clash against Shrewsbury Town next Saturday. Hereford United chairman David Keyte has given an exclusive interview about the current financial situation to BBC Hereford and Worcester. "We've not met the tax bill," said Keyte. "We were able to offer a part of the payment and the response was that if it's not cleared in full then they would send it off to their solicitors to start proceedings. "So I made a decision we may as well keep it, told them to log it down as zero payment and we'll keep it for wages. "We were able to pay the non-playing wages yesterday. "Slight disappointment that we haven't had the FA Cup money. £12,500 on the last round. "We know it will come through, probably after the Shrewsbury match. "The donations that have been coming in have been absolutely fantastic. "I understand that there are some thoughts out there that it's all too much but it does all add up." Keyte was then asked how he thought things would develope over the next week. "The players are going to be paid on Wednesday which means they will be paid in October. "We have put out tickets for Saturday's match and they are going quite well. That's money in the bank. And people are buying the double ticket for Luton. "We're clearing a week at a time. "And yes that leaves the big one, the two PAYE bills and the VAT. "The disappointing thing about the old VAT was that we had done a deal to clear that at £2K per week. We've done that for four weeks but because we couldn't pay the PAYE, the same HMRC department decided they wanted the old VAT in full or nothing. "It is around £120K that is the HMRC outstanding debt. "I don't honestly know the timescale. "The first response was that they had forwarded it to their solicitors. "When we asked about the timescale they said it depended how busy the solicitors are. "We hope there are ways of delaying the inevitable. "We don't intend to be going into administration unless we are forced into it by the taxman. "There are 70 to 80 people who are employed at various times particuarily match days through to the community trust. "There are a few hurdles to go through yet I'm sure but technically speaking we are in their hands now. "They can come in and decide what is worth £100K. I'm not too sure what is worth £100K around the ground. "In all seriousness, we are in their hands now because we haven't paid the bill."